BullionStar carries an extensive range of investment grade gold bullion coins and silver bullion coins minted by Britain’s famous Royal Mint. 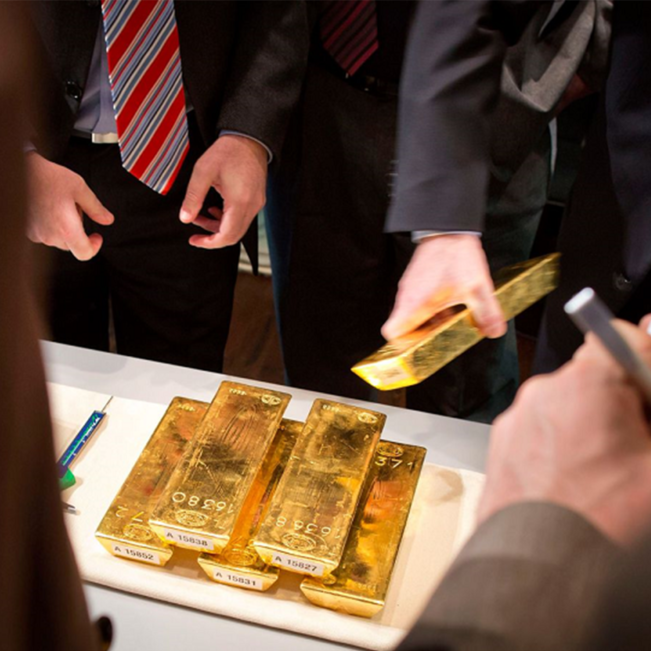 The Royal Mint is fully owned by Her Majesty’s Treasury and has the distinction of being the world’s oldest mint. BullionStar’s range of Royal Mint bullion coins includes gold and silver Britannia coins, gold and silver Lunar coins, and gold and silver Queen’s Beast coins. The Lunar and Queen’s Beast bullion coins are quite recent additions to the Royal Mint’s bullion coin range, and they substantially extend the choice of Royal Mint bullion coins now available to BullionStar customers. The flagship of the Britannia range is the handsome 1 troy ounce Britannia gold coin, which since 2013 has been minted in 0.9999 fine gold. From its launch in 1987 until 2012, the 1 ounce gold Britannia coin was minted in 22 carat gold (0.9167 fine). In 2015, the Royal Mint also introduced fractional dominations into the Britannia gold coin range in ½ oz, ¼ oz, and 1/10 oz weights. The latest 2017 issue of the gold Britannia coin commemorates the 30th anniversary of the coin’s launch in 1987, so for some investors, this year’s issue may hold some extra historical significance. The Royal Mint also issues a 1 ounce Britannia silver coin, which since 2013 has been minted in 0.999 pure silver. 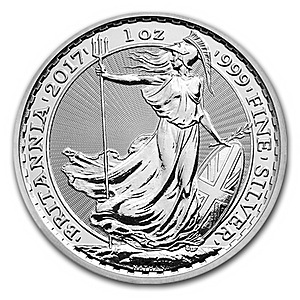 Prior to 2013, the silver Britannia was minted in 0.958 pure silver. The 1 ounce 2017 Britannia silver bullion coin is also the 20th anniversary of the coin’s issue as it was initially launched in 1997. In addition, the 2017 gold and silver Britannia coins both contain a new security and design feature in the form of micro inscribed radial lines on the obverse of the coin, which are configured as an intriguing radial sunburst pattern behind the Britannia figure. The Britannia name is derived from imagery of Britannia featured on the reverse face of these coins. 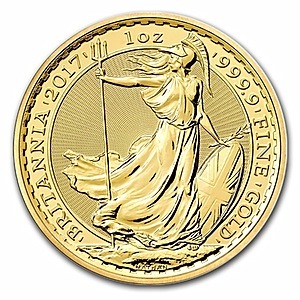 The current Britannia imagery displays a standing female symbol of strength embodied in the naval tradition and was designed by English sculptor and coin designer Philip Nathan. Although gold and silver Britannias are non-circulation coins, all gold and silver bullion Britannia coins are still classified as legal tender in the UK. 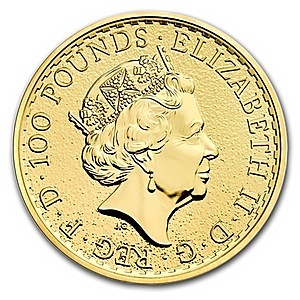 For example, the 1 oz Gold Britannia is legal tender with a face value of GBP 100. 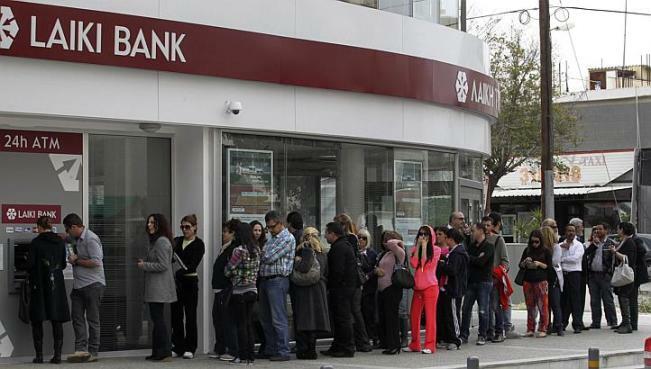 As legal tender, all Britannia’s are exempt from UK VAT and UK Capital Gains Tax. 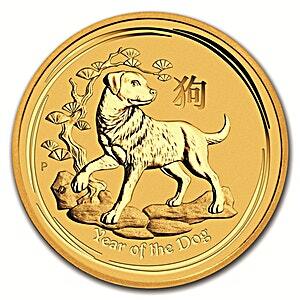 In 2014, the Royal Mint launched a new series of gold bullion and silver bullion coins to celebrate the 12 signs of the Chinese zodiac. Officially called the Shēngxiào Collection, this series is more commonly known as the Royal Mint’s Lunar series. Each of the 12 coins in the series features imagery of animals of the Zodiac on the reverse face of the coins. The imagery has been designed by British Chinese artist Wuon-Gean Ho. 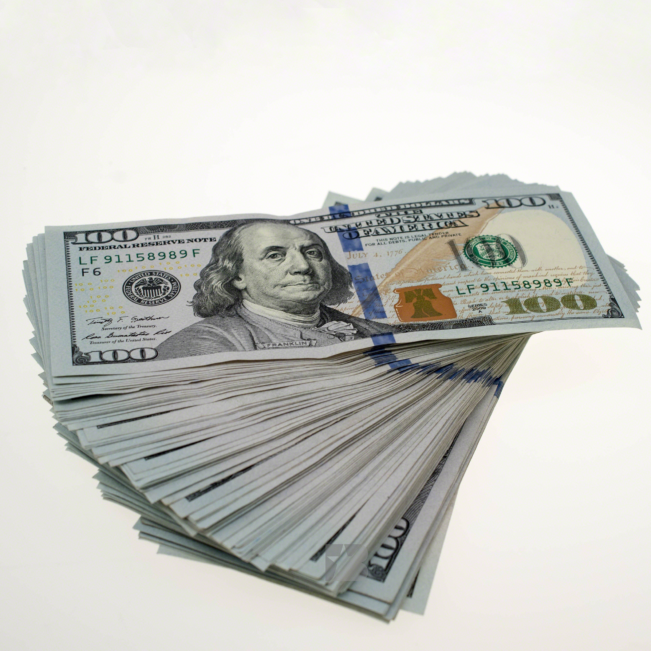 The gold Lunar is minted from 99.99% pure gold and is issued in the 1 troy ounce and 1/10 ounce denominations. The silver Lunar coin is minted from 99.9% pure silver and is issued in a 1 ounce denomination. Each of the gold and silver Lunar series consists of one new coin design per year. 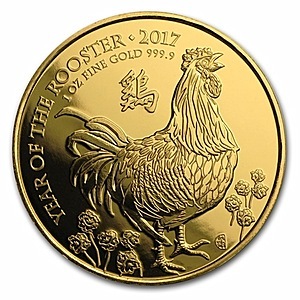 The series began with the Year of the Horse in 2014, the Year of the Sheep in 2015, the Year of the Monkey in 2016, and most recently the 2017 gold Lunar Year of the Rooster, a coin which features an attractive design of a Marsh Daisy Rooster. The forthcoming 2018 Lunar design will celebrate the Year of the Dog. Royal Mint Lunar gold bullion and silver bullion coins are also legal tender in the UK, and, for example, the 1 oz gold Lunar coin has a face value of GBP 100. In 2016, the Royal Mint again expanded its bullion coin range with the addition of the Queens Beasts series minted in gold and silver. The images on this series of coins, which were designed by Royal Mint engraver Jody Clark, are based on statues of 10 heraldic beasts that were commissioned for Queen Elizabeth II’s coronation ceremony in Westminster Abbey in 1953. These statues were themselves based on the extensive history of British royal ancestry and heraldry associated with the British monarch. 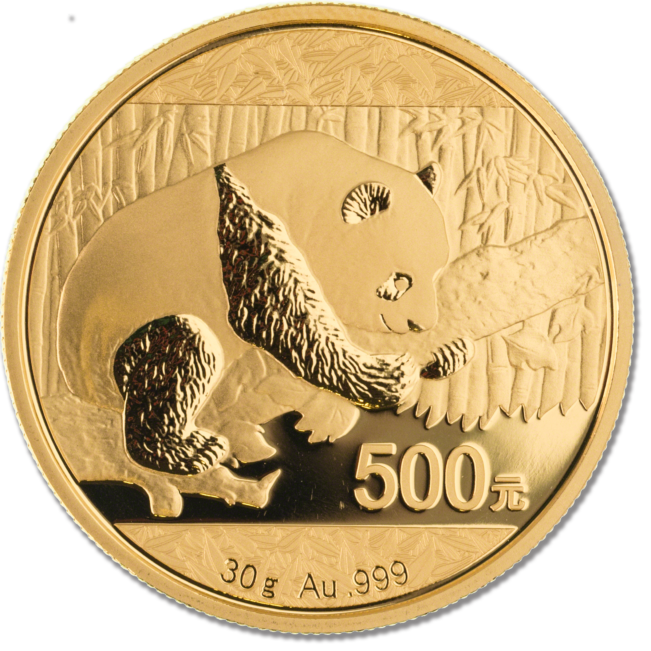 In gold, the Queen’s Beasts gold coin is available in a 1 troy ounce weight of 99.99% pure gold and a 0.25 troy ounce weight of 99.99% pure gold, while in silver, the Royal Mint has opted to produce a 2 ounce coin minted to a very high 99.99% pure silver standard. This 2 oz silver coin is the Royal Mint’s highest purity silver coin to date. The Queen’s Beast gold and silver bullion coin range will ultimately consist of 10 coins, with an average of 2 different designs of new legendary creatures issued each year. 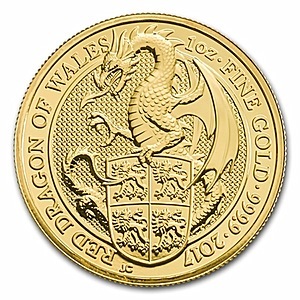 The first three bullion coin designs launched so far are the 1 ounce Lion of England gold coin, the 1 ounce Griffin of Edward III gold coin, and most recently the 1 ounce Red Dragon of Wales gold coin. Also currently available are a 0.25 ounce Red Dragon gold coin and a 0.25 ounce griffin of Edward III gold coin. 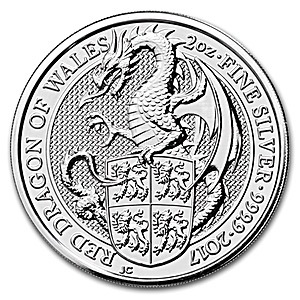 Likewise in silver, the Royal Mint has so far issued a 2 oz Lion of England silver bullion coin dated 2016, a 2 oz Griffin of Edward III silver bullion coin dated 2017, and a 2 oz Red Dragon of Wales silver bullion coin dated 2017. Note that the Royal Mint has also issued a limited-edition proof 10 oz silver Lion of England coin dated 2017 which is the largest weight silver coin ever issued by the Royal Mint. 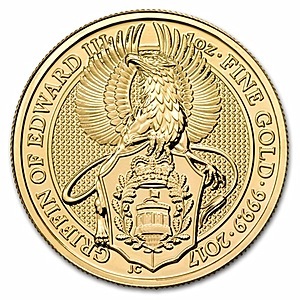 While the reverse faces of the above gold and silver bullion coins feature imagery of Britannia, Lunar zodiac animals, or Queen’s Beasts, respectively, the one consistent feature of all of these coins is that their obverse coin face features a head portrait, or effigy, of the reigning British monarch Queen Elizabeth II. Royal Mint coins issued since 2016 feature a contemporary head portrait designed by the Royal Mint’s engraver Jody Clark. Up until 2015 for a number of years, the portrait used a portrait designed by well-known sculptor Ian Rank Broadley. 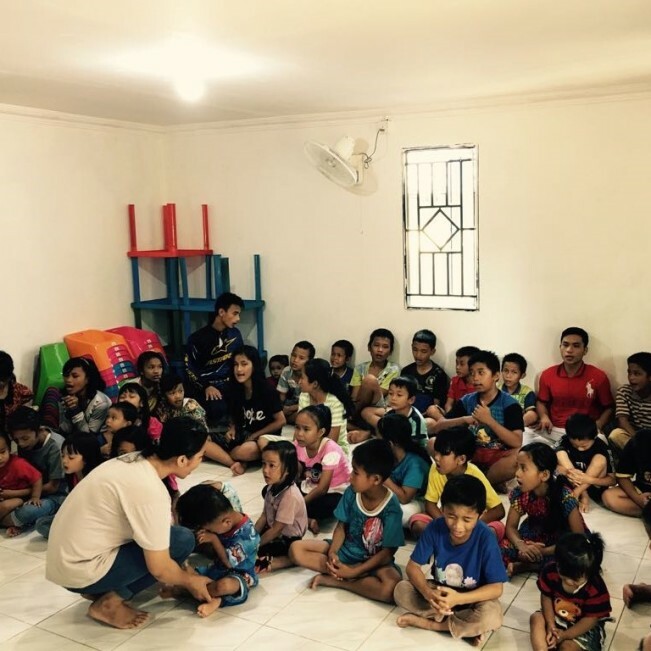 A key driver of gold and silver bullion coin sales in Singapore is whether a particular bullion coin is exempt from Singapore’s Goods and Services Tax (GST). 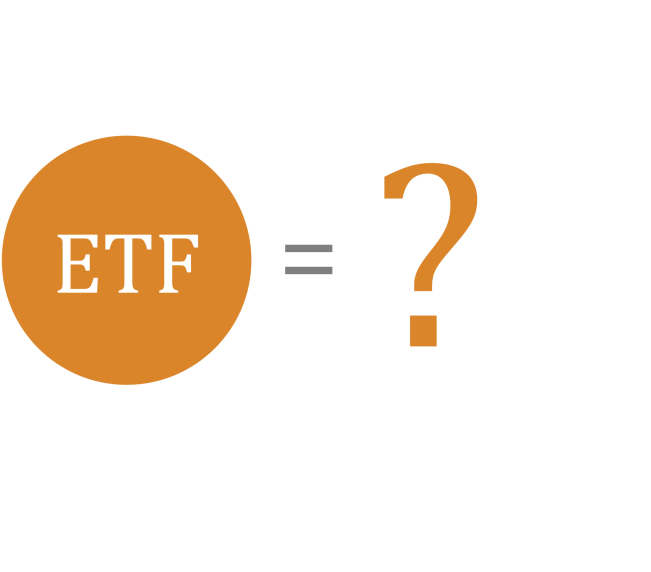 Qualifying coins are defined as Investment Precious Metals (IPM) by Singapore Customs. Gold and silver Britannia coins, gold and silver Lunar coins, and gold and silver Queen’s Beast coins are all defined as Investment Precious Metals (IPM) by Singapore Customs, and so all of these bullion coins are exempt from Singapore GST. 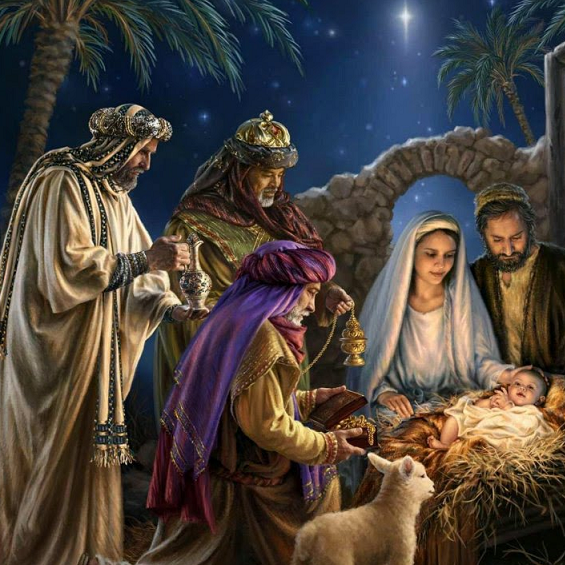 The Royal Mint also produces the world-famous Gold Sovereign coin, a coin which has been minted in its modern form since 1817 and which has therefore been minted for some 200 years now. The Sovereign is legal tender in the UK with a nominal value of one pound sterling and features the famous imagery of St George slaying a dragon, imagery which was designed by the Italian engraver Benedetto Pistucci for the first modern Sovereign in 1817. 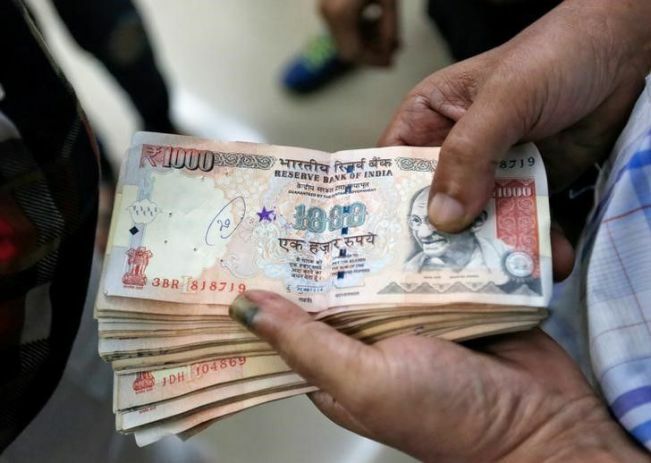 Currently the Mint produces both a Sovereign and a Half Sovereign denomination, however, both of these coins are minted in 22 carat gold, i.e. with a gold fineness of 91.67%. This unfortunately means that the Gold Sovereign does not qualify as IPM under Singapore Customs Rules because qualifying IPM is defined as containing 99.5% pure gold or higher. 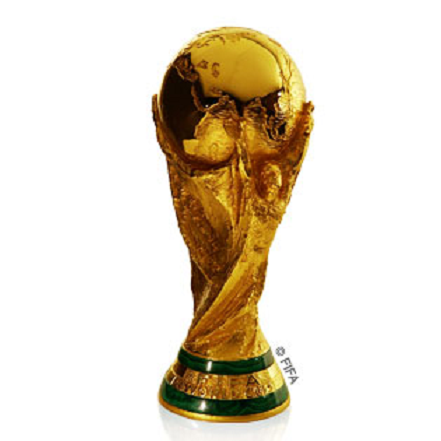 The Gold Sovereign is thus not currently on the Custom’s list of exempted precious metals coins. 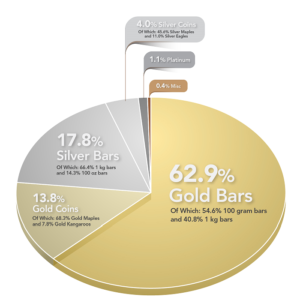 Although there is strong potential interest among BullionStar’s customers in the Gold Sovereign, for most bullion coin buyers the lack of GST exemption currently makes the purchase of Sovereigns uneconomical relative to other bullion coins on the market. 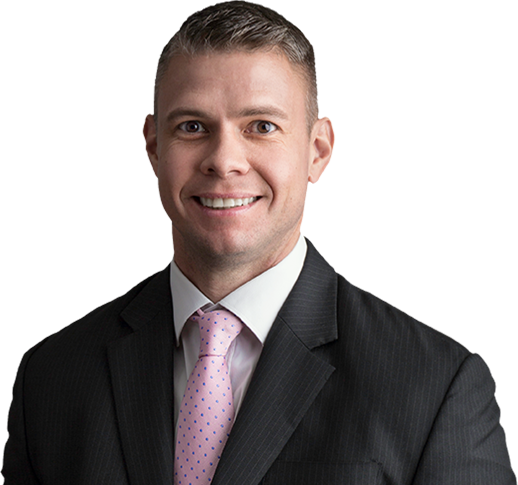 It is possible, however, that Singapore Customs may amend its IPM rules in the future as it considers and evaluates the worldwide popularity of the Gold Sovereign or if the Royal Mint raises this issue with Singapore Customs. 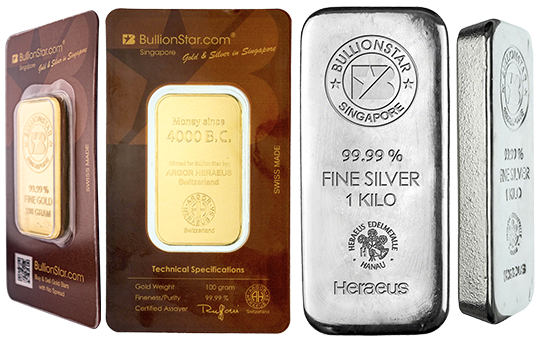 In the meantime, BullionStar does stock a number of Gold Sovereign proof sets, for example, here and here. 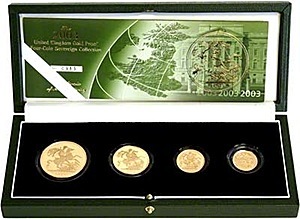 These sets, which would be of interest to collectors, consist of 4 coins, namely, the Sovereign, the Half Sovereign, the Double Sovereign (twice the weight of the Sovereign with a nominal value of £2) and a very large ‘Five Pound’ Sovereign (5 times the weight and gold content of the Sovereign with a nominal value of £5). 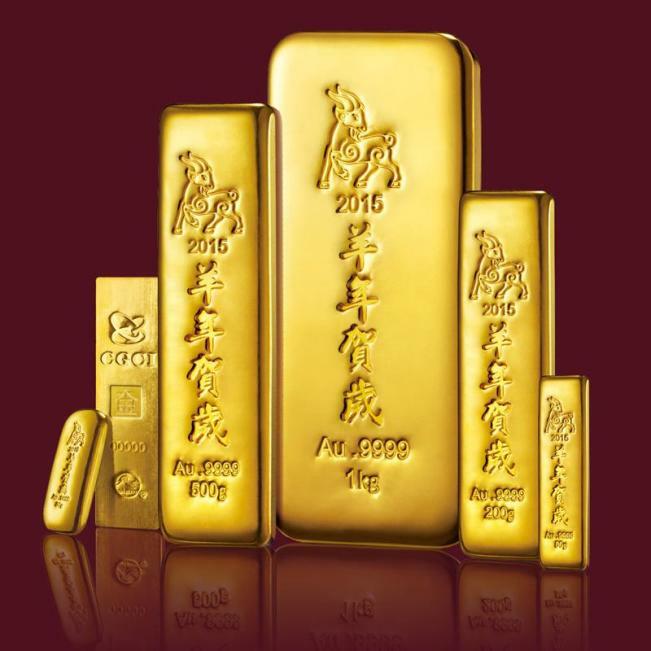 In total, this set contains 2 troy ounces of gold. 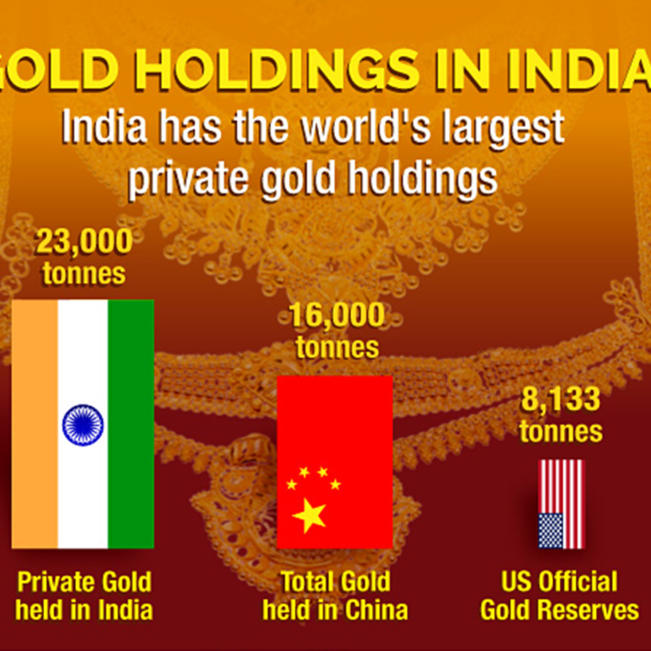 This is because the Sovereign has a gold content of 0.2354 troy ounces, the Half Sovereign has a gold content of 0.1177 troy ounces, the Double Sovereign contains 0.4708 troy ounces, and the large ‘Five Pound’ Sovereign contains 1.177 troy ounces of gold, i.e. 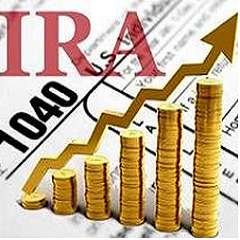 0.1177 + 0.2354 + 0.4708 + 1.177 = 2 troy ounces. Note also that all newly minted batches of Royal Mint coins, including all of the Royal Mint bullion coins discussed above, are also assayed and tested for metal composition, weight and size as part of the long-standing annual Trial of the Pyx held at GoldSmiths Hall in London which is both a practical and traditional quality control exercise that is presided over by the Master of the Mint and the UK Treasury’s Chancellor of the Exchequer. This Trial is a further guarantee that all Royal Mint bullion coins are of the highest possible quality and workmanship.